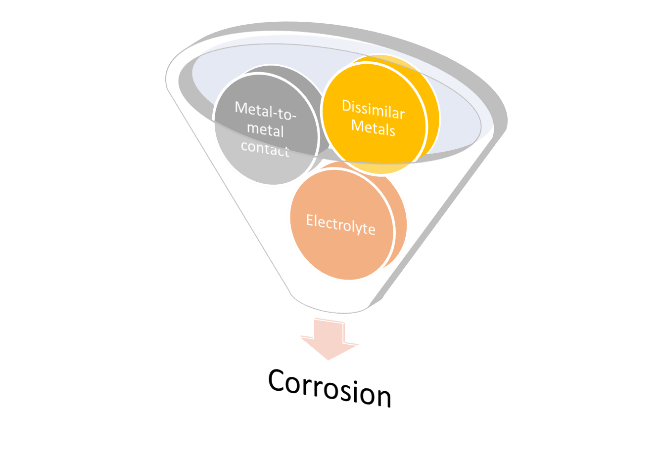 Galvanic corrosion (also called bimetallic corrosion) is an electrochemical process in which one metal corrodes when it comes into contact with another metal that is of dissimilar type. The corrosion is caused by a self-induced current created when the two dissimilar metals are in contact in the presence of an electrolyte such as fresh potable water (a weak electrolyte) and this can become stronger if the roof is within close proximity of the marine environment and salt deposits on the roof dissolve into the water. 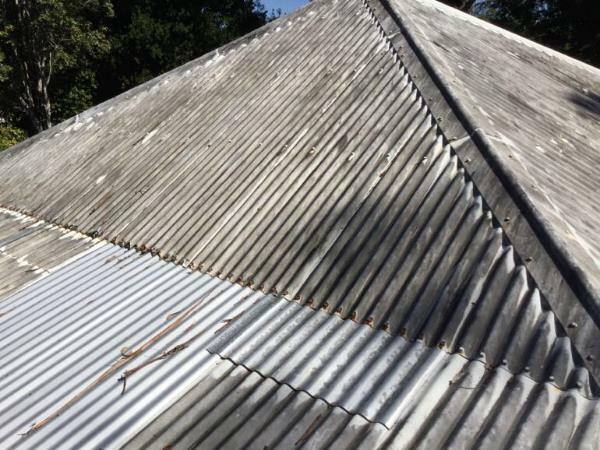 Older metal roofs in Queensland tended to be constructed out of galvanised metal sheets giving rise to the phrase “timber and tin” houses. The term galvanised iron, originated in England with the use of wrought iron sheets as the base metal in the earlier part of the 1800s. Mild steel sheeting rapidly replaced wrought iron as the base metal following improved steel making and processing methods later in the 19th century. The first Australian galvanising works were set up in Sydney in 1863 and Lysaght’s plant in Newcastle began producing corrugated galvanised roofing on 4 April 1921. The old hand-dipping process provided the metal sheets with excellent weather protection. Sheets of 0.6mm thickness (24 gauge steel) could be curved for bull-nose verandah roofs. Thicker sheets of 0.8mm (22 gauge steel) were also used for roofing although they were less common. Materials used for hot dip galvanising have not changed. However, early dipping processes tended to make the galvanising layering more uneven with thinly-coated areas more prone to weathering and rusting. On the other hand the coating could be in places very thick (as much as 800 gms/m2). The use of lead flashings on this type of roof did not cause galvanic corrosion so lead on galvanised roof sheets was and is common. In the 1960s Colorbond or pre-painted roof sheets commenced production in Australia as did Zincalume sheets. Colorbond has a zincalume core with a painted surface to allow for a variety of aesthetically pleasing applications. Zincalume is a metallic-coated steel product that consists of 55% aluminium, 43.5% zinc and 1.5% silicon. However the entire coating is approximately 80% aluminium. The coating gives it a lifetime of four times that of galvanized steel and is lightweight, with edge protection. Due to the metallic-coating system employed, zinc sheets are incompatible with lead flashing and copper piping. Colorbond roofing has a higher resistance to galvanic corrosion because it has an inert paint layer covering the reactive Zincalume coating. 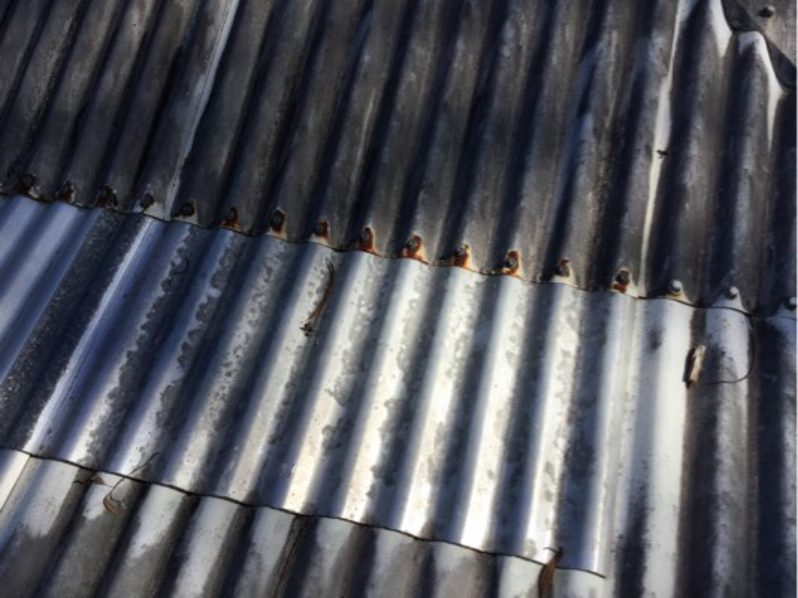 In the image below, it can be seen that water running from an upper galvanised roof to a lower zinc roof is starting to show signs of galvanic corrosion in the discolouration of the zinc sheets. 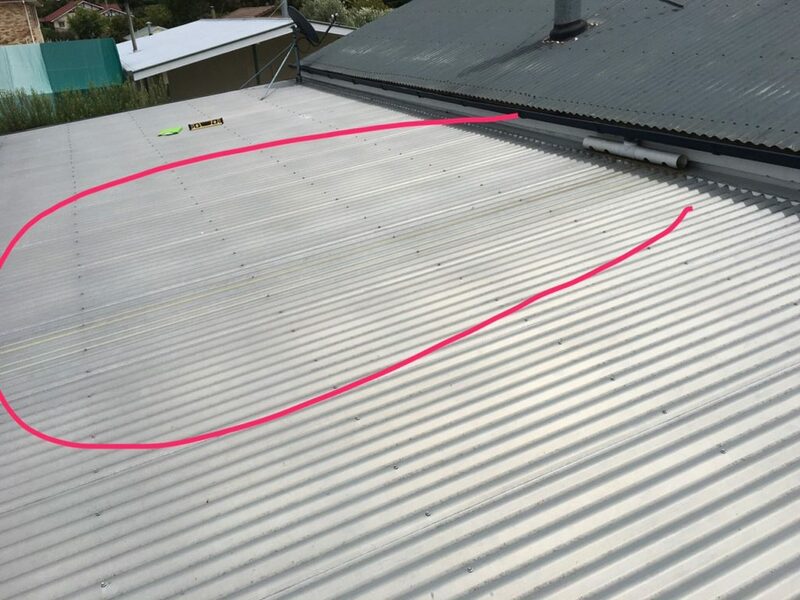 Below is a more obvious example of a roof we assessed in Yandina on the Sunshine Coast where the reaction between the dissimilar metals has eaten through the top sheet. You will note the roofing screws to the right where the galvanised sheet is on top of another galvanised sheet are not showing signs of corrosion. However just a short distance away roofing screws that are fixing a galvanised sheet to a zinc sheet are obviously corroding due to being in contact with the dissimilar roof sheets. When installing or replacing metal roofs it is critical that consideration be given to the pre-existing metal sheeting and what is being used to repair it. While galvanised sheeting is more expensive it is still available and will prevent galvanic corrosion occurring.